Archangel Gabriel, Archangels, Gabriel, Gabriel with trumpet. Church of San Michelle, Florence. 1359 A.D.
Gabriel means God is my strength. 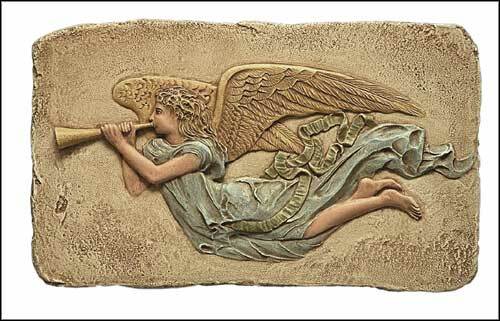 Gabriel is the Angel of annunciation, resurrection, mercy, vengeance, death and revelation. Gabriel is the ruler of heaven and ruler of the Cherubim. Gabriel is said to sit on the left hand side of God. Mohammed claimed it was Gabriel who dictated to him the Koran. In Jewish legend it was Gabriel who dealt death and destruction to Sodom and Gommorah. Gabriel appeared to Daniel to tell him of the coming of a Messiah: a message which later he repeats to Mary in the annunciation. Earlier he had announced to Zacharias the coming of John the Baptist.